Small-sized fiber optic splice closure SSD MTOK-L7/48-1KS1645-К produced by SvyazStroyDetal, designed for installation in confined spaces – in cable ducts floowed by water, in technical rooms, on pillars. 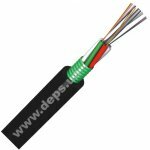 Fiber optic splice closure provides installation of urban and suspended optic cables with one cover, and cables with original designs – flat fiber optical cable, micro cables up to 48 fibers. Method of sealing the casing with mechanical end cap, using a plastic clamp. Optical coupling is equipped with stepped pipes, thin sections that are specifically designed for cable diameters up to 10 mm. The design of inside elements of the sleeve allows mounting central power components and peripheral power components matched optical cables. 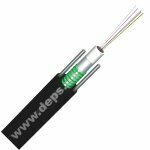 Fiber optical splice closure has: 2 round tubes with an inner diameter of 20 mm, 2 round tubes with an inner diameter of 16 mm and one oval pipe. 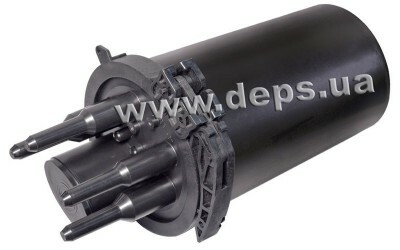 Fiber optical splice closure equipped with plastic bracket, where possible to install three cassettes, type KS. Optic splice closure MTOK type, designed for direct and branched splicing of fiber optical closure by different designs without fixing armor in nozzles. Design allows mounting a central power element and others power elements of welding optical cables. Armor of corrugated steel tape and screens of alyumopolietilen shells to sleeve connected by bridges inside. Fiber optical closure allows quickly install standard fiber optical cables 14-20 mm, thin cable with diameter of 5-10 mm, and small-sixed fiber optical cables. During the installation fiber optical cables, special kit not used. in wells and reservoirs on special brackets. 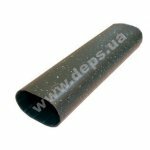 Splice-cassette KT-1645 model of SSD (Russia) production is designed for the use of compact KDZS(thermo-protective sleeves).